This Mabinogi Elf quest guide will help walk you through the mission for a beginner Elf. It will also help you earn all of your combat skills, and explain exactly how you earn each one. You can skip these missions altogether, but if you do so you won’t earn vital skills like the “Defense” and “Rest” skills. Before getting into the meat and potatoes, I should first warn you not to buy any weapons or items, because you get them for free later. And second, don’t talk with Yoff when you reach level 5. Ignore his quest for now, because it starts the Falcon quest. This guide will help get you ready for Yoff’s quest by getting you all the skills and equipment that you’ll need later on in the game. The first thing that you need to do after getting out of the starting zone is to talk with Castanea in Filia town, and deliver the letter to her. After completing that quest, talk to her about everything you have in your keyword list to gain the knowledge of skills (Like mirage missile, but we’ll get to this quest later). I would suggest doing the same thing with all the other NPCS you come across just so you can gain the keywords and knowledge for the other skills, people, and quests as well. After talking with Castanea you should gain another quest about talking with the healer, run to the healer’s house that is located just to the south of Castanea and talk to Atrata the healer. Follow her instructions for drinking the health potion, and then complete the quest. The next quest on the list will first require you to run back to Castanea and talk with her. You will receive a quest to kill 5 four legged brown foxes. Run east out of Filia town until you see a small farm just on the horizon, with a group of young four legged foxes near by. Kill 5 of them and head back to town and talk with Castanea again. She should now teach you the Magnum shot skill. Open your skill window and click the “Learn” skill button. Once the skill is learned you will complete the quest. Next, you will have to use Magnum shot in action. This skill is used to knock back enemies, so it’s best to shoot the monster with a normal shot, and then knock it back with Magnum. Head south to hunt and kill 5 young grey armadillo, which is just a standard mob grinding quest. Once you’re done, report back to Castanea to finish the quest. Castanea will now teach you the “Hide” action skill. It’s a move that only Elves can use. After you’re done, complete the quest and talk to Castanea again. She will now give you a quest to gather water for the healer. Run around town until you see a well, fill your empty bottle up with water, then go visit the healer. If you can’t find a well there is one right near the general store and another one near the healer just east of town adjacent the cows. Report back to Atrata and she will have you drink a Stamina potion. Once you’re done talking with her complete the quest to move on to the next one. Your next mission is to talk with Granites, the general store owner. He will give you some berries to eat, so open your bag and eat them. After you’re done talking with him he will tell you to go find some berries on your own. Find a tree, any tree, and start beating on it. It may take awhile, but it will eventually drop a berry. Once you have the berry, talk with Granites again to move on to the next quest. Your next task is to deliver the holy water to Castanea. Talk to her and you will then be given a new task. Run over to Meles at the weapon shop and talk to her to deliver the holy water to her. As soon as you deliver the water, she will give you a new task to upgrade your combat skills. Head south to the young black armadillo, and use a melee weapon or your fist to train up your combat mastery skill. Kill 5 of the young black armadillo and then level your combat mastery skill to Rank F. Once done, head back to Meles to complete the mission. In case you were wondering, this is where you will now earn the defense skills. Read the book if you’re new to the game, it helps a bit in teaching you the basics, but the best way to learn is by using it in combat. Everyone has their own way of fighting, so test out what works best for you. This now brings us to the next mission: Meles wants you to train up your defense skill, so you will have to kill 5 young-tailed Mongooses. Mongoose are located at the far east-side of the area, so you have to run a long ways to get there. A good tactic for defensive fighting is to block as soon as you knock the monster back. While it’s sliding away, walk away from them and at the same time activate defense. By walking away, it gives you a few more seconds to charge the skill to block their next move. Once they are dead, report back to Meles. As a reward, Meles will now teach you the Smash skills. Head back to Castanea again and talk to her. She will now teach you the healing skill. Your mission is to heal someone else, or yourself. After you talk with Castanea use the healing skill on yourself, then complete the quest. You will now be given the “Magic mastery” skill. It’s just like combat mastery, but for magic users. The more you use magic, the stronger the skill gets. Next run over and talk with Meles again to learn some new skills. Meles will teach you the windmill skill, and ask you to go train it up. I think you know the drill by now, head south and go fight some young black armadillos. You don’t have to fight these, but they are the closest. Windmill 5 of any monster, then report back to Meles. Atrata the healer now wants to teach you the the first aid skill, after talking with her you will complete the quest. Run back over to Meles again because she now wants to teach you something else. Upon talking to her you will gain the counter attack skill. Like before, she wants you to practice the skill, this time on the Mongoose again. Head all the way to the east and out of town, and counterattack 3 of them. It’s a bit tricky at first learning how to use it because by now you should be quite strong and the Mongoose die in a few hits. After you counter them all talk with Meles again to finish the mission and complete the quest. You are now half way done with the starting quests as an Elf in Mabinogi. This concludes part 1 of the Elf quest starter guide. For more guides and walkthroughs of Mabinogi and other MMOs, be sure to check them out right here at Bright Hub. 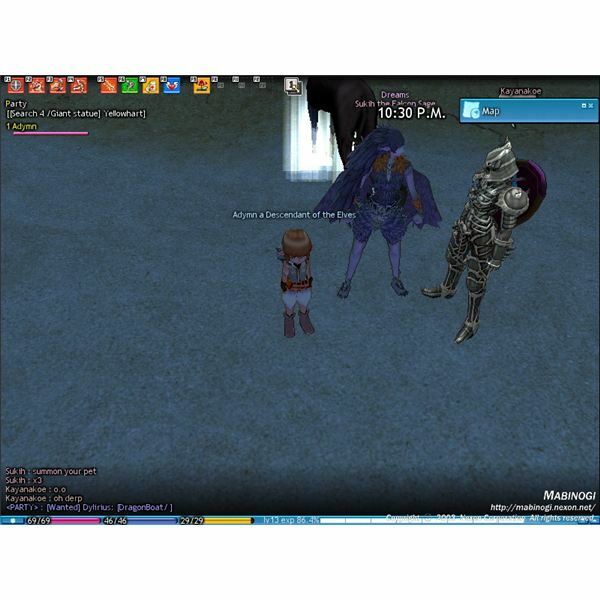 Need more info on Mabinogi? Feel free to visit the Official Website. Newbie Elves looking for a helping hand in questing and combat can find everything they’re looking for with the following guides.